Born in 1928 and still going strong, Burt Bacharach studied for a time with the composer Darius Milhaud (one of "Les Six"), played in jazz bands in the 1940s and was then to turn towards composing and song-writing. He holds a unique place in songwriting of the 20th Century. His surname is not an adopted one but it sounds like a groovy form of Bach so perhaps it was inevitable that Bacharach would be remembered for his groovy music. Among his best-known songs are "Magic Moments" (sung by Perry Como), "Anyone Who Had a Heart", "Walk on By", "Do You Know the Way to San Jose? ", "I'll Never Fall in Love again", "That's what Friends are for", "Always Someone there to Remind me", "I Say a Little Prayer", "What the World Needs Now is Love, Sweet Love" and "Close to You" (sung by the Carpenters). His songs are so well known that the UK TV programme called "Pop Idols" had a "Burt Bacharach" night where each contestent sang one of his songs. As a songwriter he has worked with a number of people, but it was his partnership with the lyricist Hal David that was to prove most fruitful in terms of their prodigious output of songs recognised the world over, and for a good proportion of that time it was Dionne Warwick who realised their songs beautifully. The writing partnership was also to produce the musical "Promises Promises". Bacharach was married for a time to Carole Bayer Sager with whom he also wrote numerous songs. Naturally mfiles wants to highlight Bacharach's contribution to film music. In terms of sheer quantity, that contibution has been primarily the use of his pre-existing songs within films (and there have been many, many films with his songs), and from time to time he was commissioned to write theme-songs for films. Among these commissions there is "The Best that You Can Do" (with Carole Bayer Sager, Christopher Cross and Peter Allen) winning an oscar for the movie "Arthur". Naturally, Bacharach was asked to write a song for the sequel "Arthur 2: On the Rocks". But as well as the songs, Bacharach was also on occasion asked to write the principle music for films. This he did in the form of incidental tracks which still carry the happy, carefree vibes of his songwriting. "What's New Pussycat" and "Casino Royale" (the first James Bond film with this title) both feature truly great soundtracks from the master. "Butch Cassidy and the Sundance Kid" won an oscar for its music and for best song "Raindrops Keep Falling on My Head" (with Hal David). Bacharach is such an icon where groovy love music is concerned that he has made cameo appearances in all the Austin Powers films, which of course feature his songs among others. The latest film in the series "Goldmember" also has Bacharach's song "Alfie" transformed into "Austin" for the End Credits, and features an earlier cameo from Quincy Jones. Well into his 70s now, Bacharach is still giving concert tours. 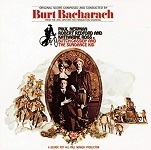 Butch Cassidy and the Sundance Kid - groovy instrumentals and its bicycling song "Raindrops Keep Falling on my Head"
Alfie (2004) - the film remake with Jude Law in the title role has soundtrack credits for John Powell, Mick Jagger and Dave Stewart (of Eurythmics), and re-uses the original title song and the song "Wicked Time"
There is a Burt Bacharach fan web-site at www.bacharachonline.com.